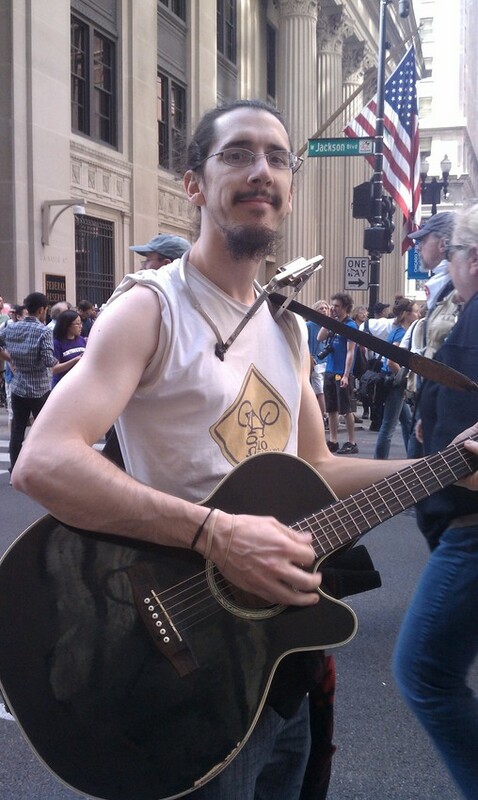 Protester Gio Andollo came to Chicago with his guitar in hand. The throngs of people descending on Chicago for the NATO summit hope to shed light on what they see as the world&apos;s most pressing problems, such as war, injustice and poverty. These are broad issues, but behind them stand individual people with stories to tell. WBEZ reporters and producers are inviting some protestors to step out of the crowds — if for just a few minutes — to explain how they came to their causes and Chicago. Gio Andollo, a New Yorker, was part of the original Occupy Wall Street movement. He told one of our producers that people of his generation are underemployed, overeducated and don&apos;t grasp the full import of world events. He said he&apos;s been touring East Coast occupations, a fact that led him to consider a trip to Chicago a natural next step, especially to protest what he called NATO’s "agenda of war and perpetual poverty." Friday afternoon we found Andollo strumming his guitar and singing one of his original "Occupy" songs. This one touches on a lot of things: peace, the types of goods we buy, and how those goods are produced.